A shooting spree outside Washington DC has been blamed on a Filipino Federal Security Officer. 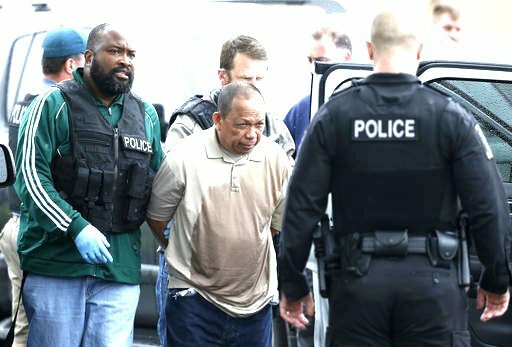 Eulalio Tordil, an employee of the Federal Protection Service went on a shooting spree outside of a high school, a mall and a supermarket in the Washington D.C. area. A total of three people have died from the incident, while three others have been wounded in the shooting. Tordil provides security at federal properties for the Federal Protective Service – he was taken into custody Friday without incident near the supermarket where his last shooting spree took place. Authorities said a brief manhunt was underway when the Filipino was arrested – some say the shooting brought back the fears that plagued the city in 2002 when the D.C. Sniper paralyzed the capital city and its suburbs. Plain-clothed officers trailed Tordil for approximately one hour, watching him walk from store to store, waiting for the right time to arrest him. He earlier threatened to ‘commit suicide by cop’ and police wanted to make sure the public was safe before the closed in on him and put him under arrest. Authorities noted that Tordil had been put on administrative duties after a protective order was issued against him in March after his Filipina wife said he had threatened to harm her if she left him. The same report said that Tordil had subjected his children to ‘intense-military-like discipline.’ The reports said that he forced them to do pushups and when doing wrong he would put them into detention by forcing them into a dark closet. Police say the entire shooting spree started on Thursday when Tordil followed his wife to their children’s high school. As she waited in an SUV in the parking lot of High Point High School, he confronted her and shot her – he is also accused of shooting and wounding a man who attempted to intervene. On Friday morning, approximately 15 miles from the school, police responded to a shooting at the Westfield Montgomery Mall in Bethesda, Maryland. At the mall, one person was shot and two others were shot attempting to come to the first person’s aid. One person died in the incident and another was in critical condition. Approximately 30 minutes later, while police were still on the scene at the mall in Bethesda, police received a call about a shooting at the Giant Food store in Aspen Hill, just five miles away from the mall. This time a woman who was sitting in her car was shot and killed at close range. Police spotted Tordil and when he returned to his car police surrounded him and arrested him without incident. The suspected weapon used in all the crimes was discovered inside the vehicle, so far no report on what gun was used. A Federal Protective Service spokesperson said that Tordil was put on administrative duty in March – his badge, weapon and credentials were taken at that time. Filed Under: News, World Tagged With: D.C. sniper, Filipino Bethesda Maryland, Filipino Washington D.C.